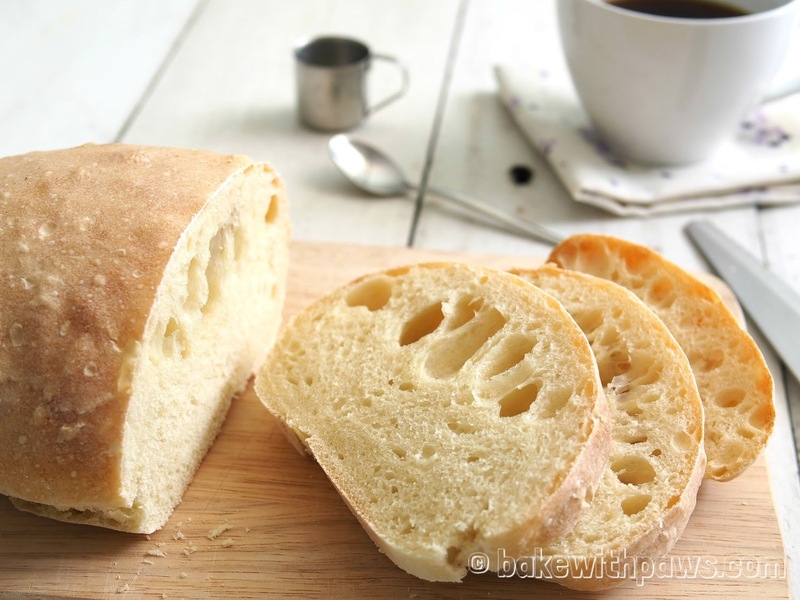 Two years ago I shared a Ciabatta recipe that was good but I’ve recently found an even better recipe. This recipe is adapted from “Cook’s Illustrated Baking Book” that was a Christmas gift from a thoughtful friend. I found this recipe rather interesting as it uses milk. As explained in the book, “we learned that milk contains a protein fragment called glutathione, which acts to slightly weaken the gluten strands. A small amount of milk was enough to moderately reduce the size of the bubbles”. Recipe adapted from “Cook’s Illustrated Baking Book” with some modifications. 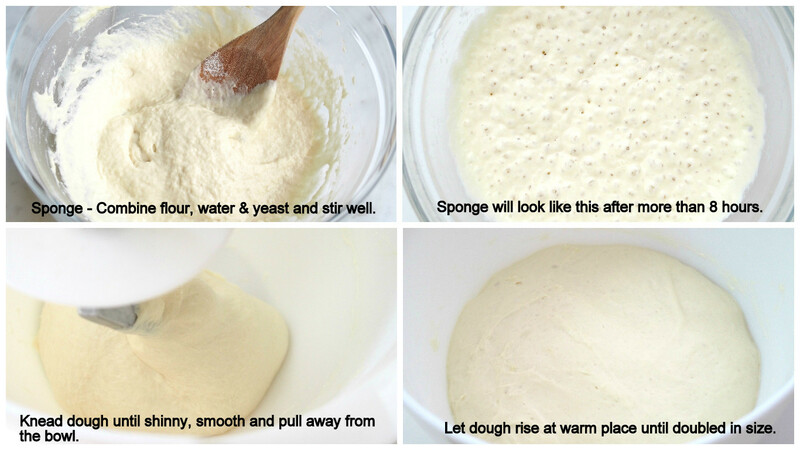 Combine flour, yeast and water in medium bowl and stir with wooden spoon until unform mass forms, about 1 minute. Cover bowl tightly with Clingfilm and let stand at room temperature for at least 8 hours or up to 24 hours. Place sponge and dough ingredients in a bowl of stand mixer fitted with dough hook and knead bread on medium speed (No. 2.5 to 3 for Kenwood Chef) until smooth and shinny (dough will be very sticky) and pulls away from sides of bowl for about 15 minutes. Spray rubber spatula or bowl scraper with vegetable oil spray. 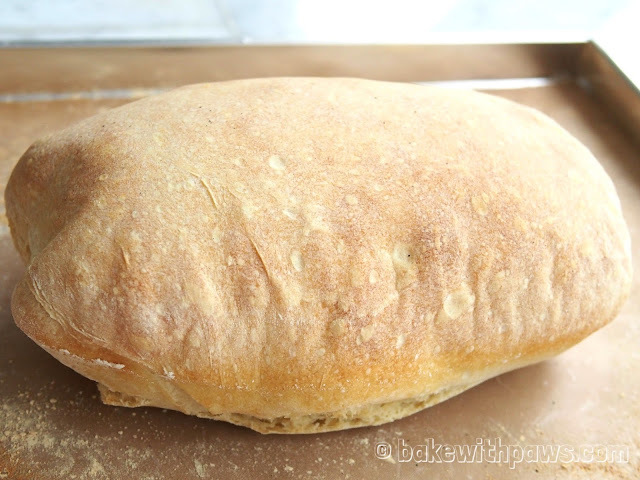 Fold partially risen dough over itself by gently lifting and folding edge of dough toward middle. Turn bowl 90 degrees; fold again. Turn bowl and fold dough 6 more times (for total of 8 turns). Cover with Clingfilm and let rise for 30 minutes. Line the flat baking pan with parchment or non-stick baking sheet and dust with flour. Transfer the dough prepared flat baking pan. Use the scraper fold shorter side of dough towards center, overlapping them like business letter form. With well-floured hands, press dough into rough 12 cm X 21 cm rectangle. Let loaves sit at warm place for 30 minutes (surface of loaves will develop small bubbles). 15 minutes before baking, adjust oven rack to lower-middle position and preheat oven to 230 C (450 F). 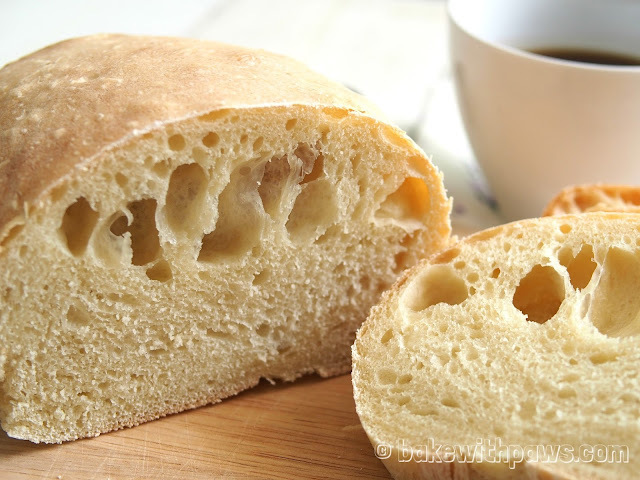 Spray loaf lightly with water and bake for 22 to 27 minutes until crust is deep golden brown. Spray loaf with water twice more during first 5 minutes of baking time. Transfer loaf to wire rack, discard baking pan and parchment sheet, and let cool to room temperature about 1 hour before slicing and serving.